Reports from NBC that former Trump campaign manager Steve Bannon is the unnamed ‘high ranking Trump campaign official’ in special counsel Robert Mueller’s indictment of Roger Stone have been independently confirmed by Gavin Sheridan, with reference to publicly available emails. The indictment states. That this high ranking official is Bannon was confirmed by cross-reference to other material and emails published in the New York Times last year. On or about October 7, 2016, Organization 1 [Wikileaks] released the first set of emails stolen from the Clinton Campaign chairman. Shortly after Organization 1’s release, an associate of the high-ranking Trump Campaign official sent a text message to STONE that read “well done.” In subsequent conversations with senior Trump Campaign officials, STONE claimed credit for having correctly predicted the October 7, 2016 release. Wikileaks began publishing hacked emails of Democratic chairman John Podesta only hours after the release of the Access Hollywood tapes — outtakes that recorded the Trump making highly-charged sexual statements. The hacked material rapidly changed the news cycle away from questions of sexual assault. By this point Bannon had been in charge of Trump’s campaign for three months. He had taken over in August 2016 from Paul Manafort – now jailed under a number of federal charges connected to his lobbying operations for Russian and Ukrainian oligarchs. This new revelation about Bannon’s role in the release of hacked emails comes on top of many which already link one of his companies to Russian cyberwarfare during the Trump election campaign. In 2014, together with hedge fund billionaire Robert Mercer, who also backed the Breitbart sites, Bannon founded Cambridge Analytica , teaming up with the SCL Group, a psy-ops and communications company contracted by the Ministry of Defence. Since its role in the EU referendum and Trump campaign, at least seven links between Cambridge Analytica and Russian information operations have come to light. These possible points of contact have been given more urgency by the revelations from Manafort’s defence papers that he passed crucial voter data to a Russian agent and was focused on the US states Wisconsin and Michigan. Those marginal states, which Trump surprisingly won and paved his way to the White House, were targeted by both Putin’s Troll Farm (the Internet Research Agency) AND Cambridge Analytica. According to his former head of research at Cambridge Analytica, Chris Wylie, Bannon saw Britain as a key domino in his attempt to take the White House for a populist candidate like Trump. Nigel Farage became a friend of Bannon’s sometime in 2010 or 2011. Two years later Bannon simultaneously created Cambridge Analytica and a UK branch of Breitbart, both funded by Robert Mercer. In late 2013, just as Bannon starting up Cambridge Analytica, he was recruiting Raheem Kassam, Milo Yiannopoulos and James Delingpole to a new site Breitbart London. According to Farage, Bannon played a crucial role in Britain’s Brexit vote. He raised a toast to both Bannon and Breitbart after the Brexit vote. The role of the news site is fairly clear. Its editor Raheem Kassam was a close aide and speechwriter who even ran for UKIP leadership when Farage resigned. But the importance of the data and electioneering company is more obscure. Before it became the main electioneering arm of Trump’s presidential campaign, Cambridge Analytica claimed it played a crucial role in Brexit. Its Canadian offshoot, AIQ, was the main beneficiary of the spending by the official Vote Leave campaign. Boris Johnson was the most high profile member of Vote Leave. Cambridge Analytica executive, Brittany Kaiser, was present at the launch of Nigel Farage’s alternative Leave EU campaign, and after the Brexit vote and Trump’s victory, both the company and campaign boasted of working together, and that Brexit was a ‘petri dish’ for Trump. 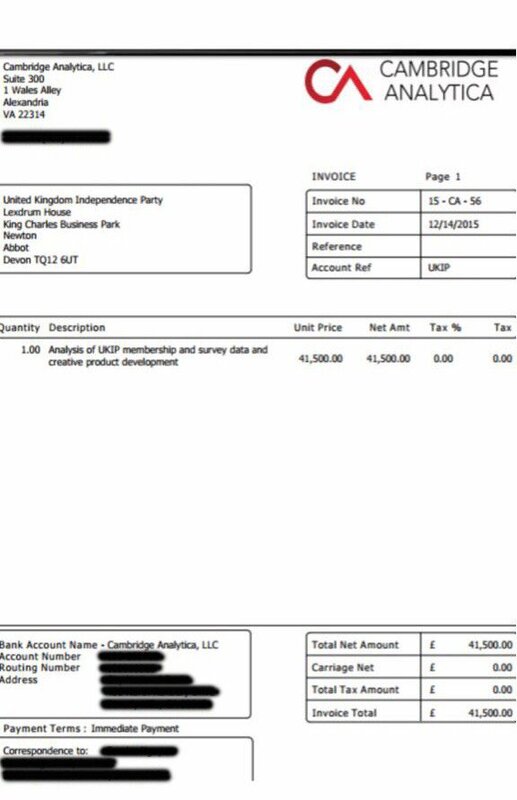 Though Farage’s Leave EU backer Arron Banks subsequently denied ever having worked with Cambridge Analytica, an invoice obtained via Byline by the Observer last year revealed services worth over £40,000 performed by the electioneering company for UKIP. The redacted address for the payment was not Cambridge Analytica’s London base, but Steve Bannon’s LA-based company Glittering Steel. Though he has met Jacob Rees-Mogg MP and government minister Michael Gove, Bannon’s most important recruit in Britain since the Trump campaign is former Foreign Secretary Boris Johnson. They reportedly became friends when Bannon was still in the White House in early 2017 and have been in contact ever since. Bannon has recently praised far-right activist Stephen Yaxley Lennon (AKA ‘Tommy Robinson’) as the “backbone of Britain” but this summer he said that Johnson “would be a great prime minister” and suggested he should challenge Theresa May. Even back then, Johnson should have been aware of the dangers of associating too closely with Bannon. As Foreign Secretary he was reported to directly by the head of the Secret Intelligence Service (MI6). A dossier written the former chief of MI6’s Russian desk, Christopher Steele, provided a road map for FBI Counterintelligence and the Mueller inquiry into Trump and Putin. He would have certainly been taken through the evidence when the Steele dossier was published by Buzzfeed in January 2017. Meanwhile, day-to-day responsibility for GCHQ also belonged to Johnson during this time at the Foreign and Commonwealth Office. It is reported that GCHQ was one of the first security agencies to become aware of suspicious “interactions” between Trump and Russian agents. When the White House accused GCHQ of spying on Trump on Obama’s orders, the intelligence agency was forced to issue a rare rebuke.